Four-color process printed on Side 1 of 130lb C2S Dull stock. Coated with Aqueous Gloss. H3 business card slits on left pocket. 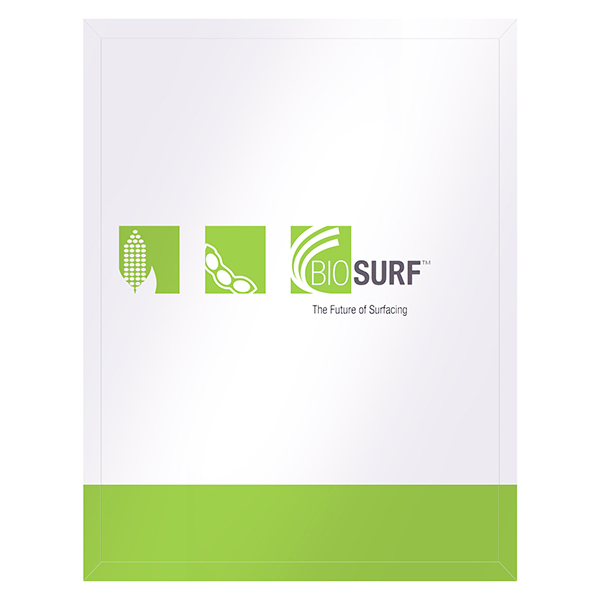 Green icons show some of the renewable ingredients used in Biosurf Solutions' sustainable surfaces, which are installed in eco-friendly businesses. The brand's tagline is emblazoned on green pockets and reinforced edges. A white line on the back cover leads to contact information, making it easy for potential clients to learn more about products and pricing. Expansion scores let the two interior pockets carry up to 3/8" thick stacks of 8 1/2" x 11" print media, for a combined capacity of 3/4". The glued right pocket gives extra security, while the left pocket is glued only on its outer edge for easier access to its contents. 1 1/8" reinforced edges on both panels help the product resist wear and tear. Both the pockets and reinforced edges are customizable with images, brand information, or even just a cool color.